"The knowledge of the world — decorationand the food for human minds"
This summer we decided to visit Spain and settle down in some sunny seaside town. Since the Spanish coast has more than two thousand beaches, the problem of choosing arose rather sharply. As a result, our temporary home was one of the tourist centers of the Costa Blanca — pretty Mediterranean city of Alicante. Firstly, to get here from Russia is simple: regular direct flights are flying from Moscow and St Petersburg. 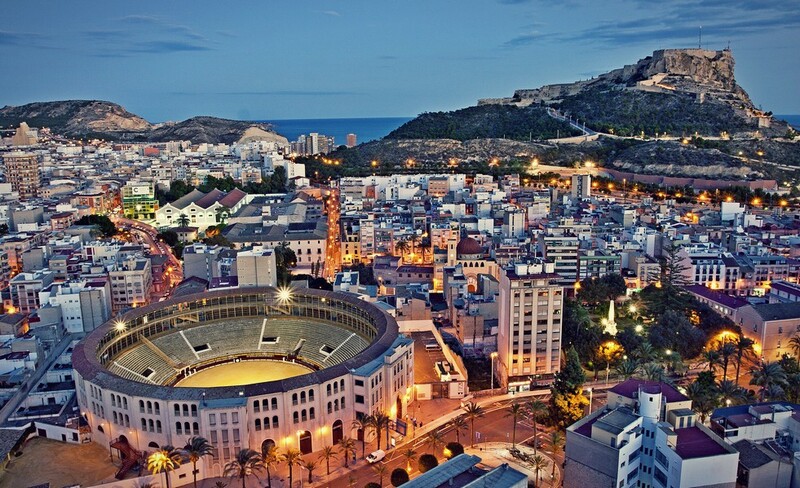 Secondly, it is conveniently located in the popular area between Valencia and Malaga, near the epicenter of the amusement parks of Benidorm.And third, by itself Alicante — a very charismatic, not very big and not an industrial city with its own long history, a rich set of attractions and beautiful beaches. Europe in general and Spain in particular are known for good roadsquality and the level of security on them. Therefore, no doubt whether it is necessary to rent a car, not even emerged — we have dedicated this topic a separate article.Before you book a car, we spent some time studying the market of companies offering their services, and chose the Spanish office with reasonable prices and positive reviews. Selecting a car we chose the most budget and a tiny car is the Fiat 500 Lounge. At that time, the price of the weekly rent is 22 euros.In addition, forour own calmness, we have insured the car "all risks" — it took another 112 euros. At the same time buying insurance eliminates the need to leave a deposit of 950 euros.By the final rent amount we added baby seat (40 Euro), as we were traveling with a baby, and a fee for the second driver (28 euros), to be able to change the driver if necessary.Under the terms of our contract payment for the full tank of petrol, with which provides car is charged additionally at the moment of applying for the vehicle.In our case, the amount was about 45 euros. At the same time required to pay an additional non-refundable service fee of 25 euros. At the airport, immediately after receiving the baggage, we turned on the bar rental company, signed a lease agreement, resolve the issue with the payment, received the keys to the car and went to a special parking area. Ride on the Fiat 500 has been a long-standing dream. Live machine made even brighter impression than expected: the compact, in an ideal sunny white color for the Spain and with a cream panel and a glass roof.Particularly pleased the stable suspension and extremely informative steering wheel. Head unit with enabled iPhone was a pleasant added bonus.For traveling with children is helpful to know that this car, despite its tiny size, comfortable enough to accommodate a family of two medium build adults and two kids. Although three or four adult passengers, of course, it would be better to choose another, more spacious option. Spain — a country with a right-hand traffic and the safety belts are required to use the driver and all passengers. On the route taken to go to the far right lane and the left used only for overtaking.The country has many intersections based on the principle of circular motion, where the main road is a circle, and all who enter it are obliged to give way. Leaving the parking lot, we went on the road in the direction of Alicante. Prior to its center had to drive only 8 kilometers. Among the several routes we have chosen a free coastal road the N-332. Orientate on the road was not difficult: at every intersection or exits installed clear information signs. As a result, all the way took about twenty minutes. We entered to Alicante from the cargo port, providing regular connections to Algeria.After passing the rocking boat on turquoise water and vibrant crowded the embankment, our Fiat stopped on a paid underground car park in the city center.We will tell more about it. In Alicante, as in many other Spanish cities, there are serious problems with parking and, as a result, very strict rules and penalties in case of violations.Permitted parking spaces are divided into free and paid. All free are indicated with white markings on the asphalt. Paid places are marked in blue. Payment of "blue" must be carried out by means of special terminals located nearby. Two-wheeled technique has its own parking spaces. They should not be confused with the car, since the area of space corresponds to the dimensions of only a motorcycle or scooter.Be careful and do not leave your car there, where is no markup. Any violation will result in a fast reaction of special services and tow trucks ply the roads permanently. Also, be aware that parking on the ground for people with disabilities is entitled to only people with disabilities. From this offender will be fined a large sum.In addition to "white" and "blue" parking lots, there is another category — parking with green markings, but they should be immediately forgotten, as they are designed exclusively for local residents. I must say that besides land-street parking there are plenty of indoor and / or underground parking. As a rule, it is paid multi-storey complex with a rated security.More often here you can buy a subscription to a certain number days with unlimited number of entries and exits. This option is useful only if you are staying in a hotel without its own parking for any length of time. In this case, you do not have to spend hours circling the city in search of free space on free parking or pay for hourly paid parking. 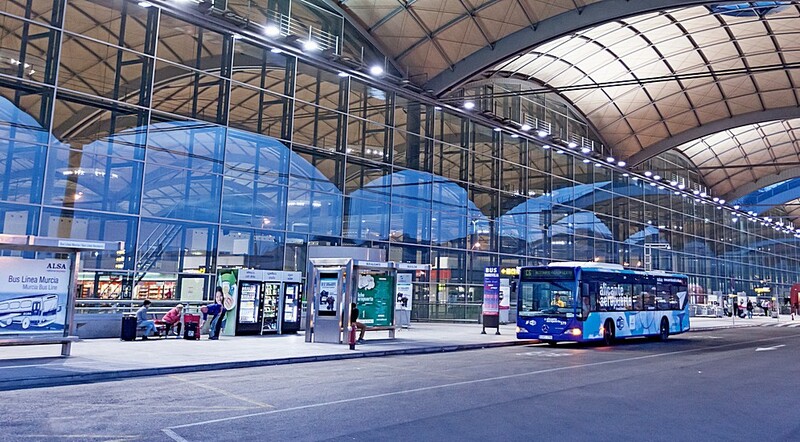 For those who do not resort to the services of leased vehicles must be said that Alicante — a cozy town, disposing topedestrian walks, but has a convenient and well-developed transport system.For example, the distance from the airport to the city center can be overcome by a bus which regularly trips every 20-30 minutes. The price of the ticket for one adult does not exceed EUR 4.The route goes from the airport building to the key points of Alicante. The main thing — remember that if you want to catch a city bus, it is necessary not only to expect it at the appropriate stop, but timely "Vote" approaching vehicles. Apart from buses in the city have light rail metro TRAM. It was created based on the old tram and railway lines built in the early last century. Basically, they are on the surface, but there are several underground stations.The total length of roads is about 110 km. Metro covers the city and the suburbs in part, it can be easy to get to the amusement park in nearby Benidorm.Besides these modes of transport tourists often use the services of a taxi. They should look on special parking lots are marked with appropriate identification marks. Just stop a passing car is unlikely. So, we arrived in the center of Alicante. 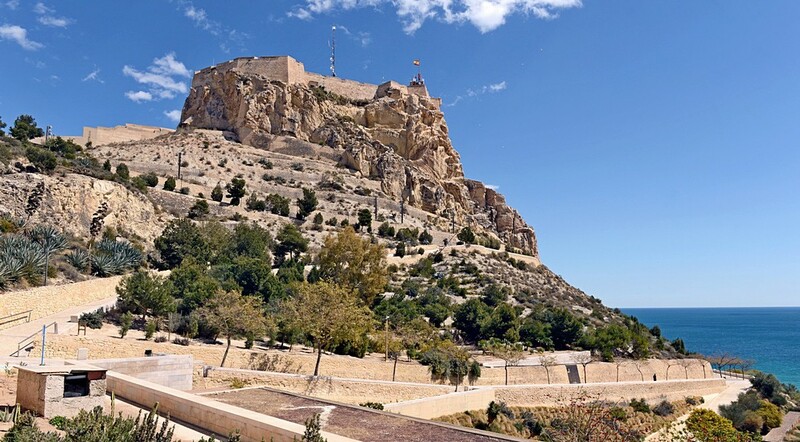 The area of this city is two hundred square kilometers, and history goes back more than three thousand years.The decoration and a symbol of Alicante, without a doubt, is the 166-meter high mountain Benacantil and its crown — one of the largest medieval castles in Spain, a huge fortress of Santa Barbara. "Continental" side of the mountain is covered with trees and shrubs, characteristic of the Mediterranean climate zone, and turned into one of the green city parks. Party benacantil facing the sea, is a bare steep rock. It is interesting that if you look at it from the beach of El Postiguet, you can see a human profile.For its natural form, this unique part of the mountain called «La Cara Del Moro» or "Moor's face." Get close to the castle itself is not difficult. You can drive by car from the street Vazquez de Mella, to walk through the park Ereta or climb on a special express elevator right through the bowels of the mountain. In this case, it is necessary pay the cost of the ticket. The entrance to the the elevator is directly opposite the beach. The castle of Santa Barbara consists of three parts, created in different periods. The oldest of them, "La Torreta", was built in the XIV century, the second, among other things includes room Felipe II, guardhouse and Bastion — in the XVI, and the third, the lowest appeared, after two centuries, in the XVIII century. There are cafes and souvenir shops on territory of the fortress. It also hosts a variety of city celebrations and exhibitions. In certain seasons the castle is filled with a group of Spanish students. Led by guides dressed in historical costumes, in a playful way, with a merry noise and din they get acquainted with the Spain history and the native Alicante. From the castle walls offers an unforgettable view of the Arab quarter, the old town, the bay, the port and the surrounding territoryextending to the horizon. Hence also as on a palm you can see all the nearby beaches. They are, without a doubt, is another, no less important landmark. Surely almost all fans of beach rest are aware of the annual international award "Blue Flag". It was established in 1985 in France. Blue Flag is traditionally celebrated beaches that meet the highest standards of water quality, ecological environment, and provided medical care and so on. 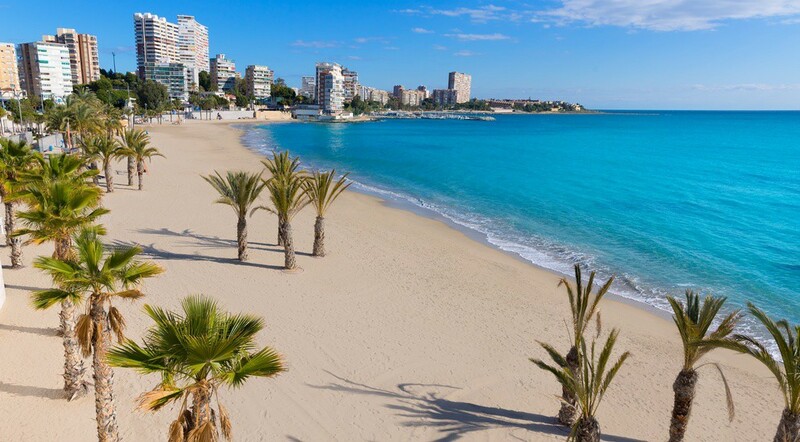 Alicante beaches for many years in a row awarded this important award. The longest city beach is a San Juan. On the three kilometer stretches areaof golden sand. Near the beach there are many restaurants, hotels, playgrounds for football and volleyball, all enmeshed network of cycle paths. Fans of aquatic adventure sports also find here a pleasant pastime. Among other beaches: located at the foot of a high mountain benacantil and Fortress of Santa Barbara central beach of El Postiguet, ideal for diving bay of Cabo de lasHuertas, a place with perfect sunsets Almadraba beach, beach on the site of the first urban settlements Albuferetaremoved and very windy Saladar-Urbanova beach.To cover all the bathing areas, should also be mentioned the island of Tabarka. Its coastal waters are declared Marine Nauture Park due to excellent water quality and the diversity of the local flora and fauna.The island is located in eleven nautical miles from the coast of the continent as part of the eponymousarchipelago. It stretches 1,800 meters long and 400 meters wide.Several centuries ago Tabarka was a haven of Berber pirates. In the XVIII century King Carlos III ordered to strengthen the city. Now its construction officially declared historical-artistic monument of great cultural significance. You can get here on two-keeled walking catamarans. They can be easily found during a walk along the promenade. Among the other attractions of Alicanteyou can mark one of the most elegant buildings — "Carboni House", built in 1925 on the orders of a large textile manufacturer from the nearby town of Alcoy, City hall, made in the Gothic style by the architect Lorenzo Chapuli in the XVIII century, the ancient church of the Virgin Mary and the Cathedral of St. Nicholas, buildings stylized Basilica of the Central Market and the Main Theater, built in 1847, and one of the oldest bullfighting arenas in the region of Valencia — Plaza de Toros. Among the interesting places of Alicante, there are a number of squares: the Plaza of Spain adjacent to the bullring, Square Luceros, especially popular during the holidays, as well as former "gates" in Alicante — the Portal de Elche square.In ancient times the last enjoyed a kind of glory. Here administers justice and carried out executions. Then it was known as "the hanging area." Today you can spend time in cafe under the shade of a huge ficus trees. The city created several green parks. One of them is Pantheon de Quijano. Its creator was the architect Francisco Gomez Morrey. The works were performed during the period from 1855 to 1857. The monument in the center of the park is dedicated to one of the governors of Alicante — Trino González de Quijano. There is huge palm park most suitable for a family picnic or a long walk among the greenery. Apart from the beautiful plants it has ponds and waterfalls, and you can rent a boat.The theme park Monte Tossa is located at the foot of the Castle of San Fernando, there are built many sports grounds: a mini-golf course, a climbing wall training, growth chess,skatepark,rollerpark, petanque playground, many children's play areas.Another great place for walking is a pier jutting out into the sea, located near the Museum of Volvo Ocean Race. The famous automobile concern is the organizer of an international round the world regatta.For most Volvo is famous for its cars. But do not forget about the division of Volvo Trucks, produce trucks (remember the movie with Jean-Claude Van Damme? ).And the heart of trucks is a diesel engine. Furthermore, Volvo Penta produces about 60% of the yacht diesel engines – Volvo and yachts are inseparable. The museum is here for a reason: in Alicante based headquarters of the race. For several years, it is here participating yachts begin their adventure and dangerous journey around the globe.Of course, Volvo Ocean Race — this is not the main and the only museum in the city. One of the most popular can be considered a Museum of Contemporary Art.It is located in the old part of Alicante, next to the Basilica of Santa Maria. Here among other art lovers you will get acquainted with the works of EusebioSempere, Eduardo Chillida, Pablo Picasso, Salvador Dali and Joan Miro.Special attention is given Archaeological Museum of Alicante. In 2004 he was awarded a special award as the best in Europe. It will also be interesting to look into the Water Museum and the Museum of bullfighting. Fans of the avant-garde and contemporary art can be interesting Cultural Center Las Sigarreras, settled in the walls of the old tobacco factory. You cannot talk about the trip to Spain and even casually not to mention the Spanish kitchen. The most famous and popular are rice dishes. The Spaniards combine it with vegetables, the meat, the fish, the seafood. In Alicante you can taste traditional for this area rice with chicken and shellfish, and on the island of Tabarka — Caldero (rice with fish) and baked on coals squid. The Mediterranean Sea provides the opportunity to enjoy plenty of fresh fish, clams and shrimp. The tuna lovers will find this like a dried, salted and stockfish. Among the desserts extremely popular egg puddings, rice rings, a traditional Sweet Bakingchurros, and all sorts of variations of nougat –turron.Special mention deserve the local alcoholic beverages: wine, brandy, sherry, grape moonshine, liquors and infusions on herbal, cocoa beans, honey and spices.One of the unique local beverages is Oruh. Also is very popular anisette AnisTenis.Usually it is drinking a short sip, slowly washed down a glass of mineral water with ice cubes. By the way, in Spain are allowed to drive the vehicle when the content in the blood of up to 0.5 ppm of alcohol. The exceptions are the drivers with less than two years’ experience — in their case, the allowable level will be twice lower. In the next article, we will continue our story about traveling through Spain and its attractions — wait for release next week!